Team World kept piling up wins when one-point victories were offered for them through the first eight draws at Orleans Arena in Las Vegas, building a comfortable lead, but Team North America pounced like a cat Saturday night when the points-per-win were doubled up to two. After sweeping all three Mixed Team Play events in the evening draw, and the six points with them, Team North America has cut their opponent’s lead significantly. Team North America now trails by five points, 17.5-12.5, and it’s game on in Sunday’s Skins games, where 30 points in six games are still available. Suddenly, Team North America’s task is not so daunting after taking it on the chin from Team World most of the week. 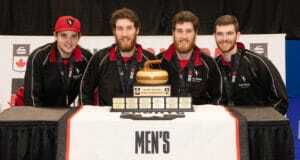 Gushue raised his game Saturday night, as did the other North American teams. For the first time all week, they looked focussed and determined. It was also a good night for Ottawa’s Rachel Homan who has struggled a bit this week. But she found her mojo and exacted a bit of revenge over Team World, skipped by Sweden’s Anna Hasselborg, posting a crucial 7-4 win. Hasselborg had beaten Homan 6-5 in Saturday’s morning Women’s Team Scramble. This time, though, Homan had all the answers, including a superb double in the fifth to go up 5-2. 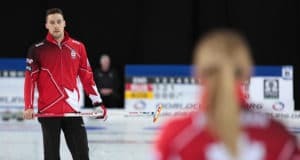 Team North America completed the sweep when American skip John Shuster, the 2018 Olympic gold-medallist, led his team to a 6-4 win over Team World’s Peter de Cruz . 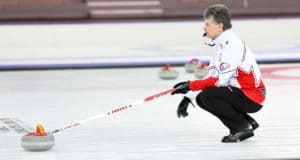 Shuster, who also got some payback over de Cruz after a loss to the Swiss skip in the afternoon’s Men’s Team Scramble, received great contributions from his all-U.S. team, including third Jamie Sinclair, second Matt Hamilton and lead Monica Walker. He also made a spectacular cross-ice double in the eighth end to secure the win.